Bio-Tech Environmental Services Phils., Inc. through its representatives, attended the 1st FAOPMA-Pest Summit held at The Empress Hotel in the beautiful city of Chiang Mai, Thailand on November 22-24, 2017. The 2-day “FAOPMA-Pest Summit 2017” convention was the FIRST convention after the merging of the FAOPMA convention, and the Pest Summit series. 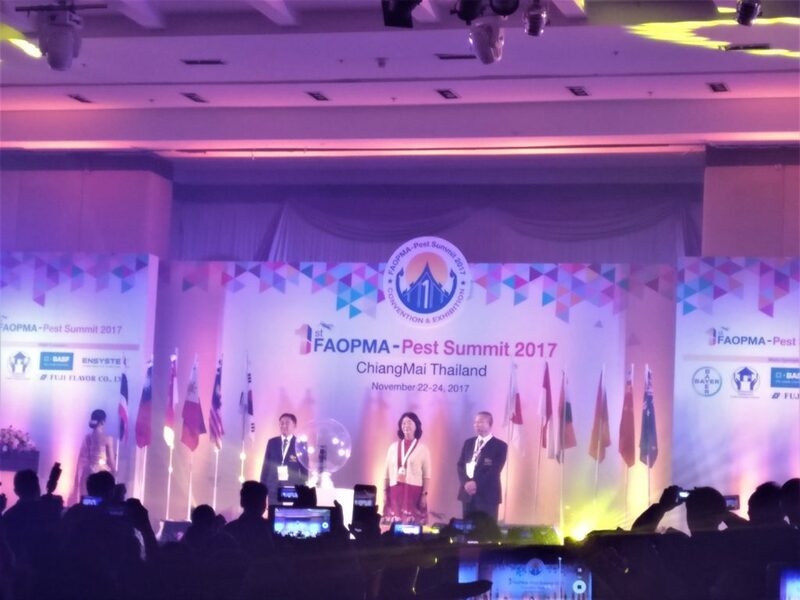 FAOPMA or The Federation of Asian and Oceania Pest Managers’ Association, has a long 27 years of convention history, and there have been 7 highly successful Pest Summit conventions in the past. By merging both, member countries can now speak and represent the pest management industry in Asia and Oceania in one voice. FAOPMA-Pest Summit 2017 focused on the New Perspectives in Urban and Public Health IPM in Asia and Oceania, plus it included a 1-day AIB Certification Program on “Basic Integrated Pest Management for Food Plants”. All attendees received a FAOPMA participation certificate and those who passed the test received an AIB certificate. This historic event featured world class speakers, and more than 60 exhibition booths, showcasing today’s leading edge technologies and services of the pest management industry from around the world. This extraordinary convention which will now be a yearly event, is tailor-made for the pest management business owner and their staff; chemical and equipment providers; food-processing industry personnel and their staff, QC/QA personnel, and other related businesses. FAOPMA-Pest Summit 2018 with be held at Shenzhen Convention & Exhibition Center in Shenzhen, China on September 26-29.